Hello! Today was the first day of school for our kiddos in Iwakuni, Japan. It’s good to be back into the full swing of things but it sure was quiet around the house (plus the cat is missing…). Fall is still on the brain so for today’s Fall inspiration, I’m sharing some beautiful and modern Fall home tours and decorating ideas from some of my favorite bloggers. 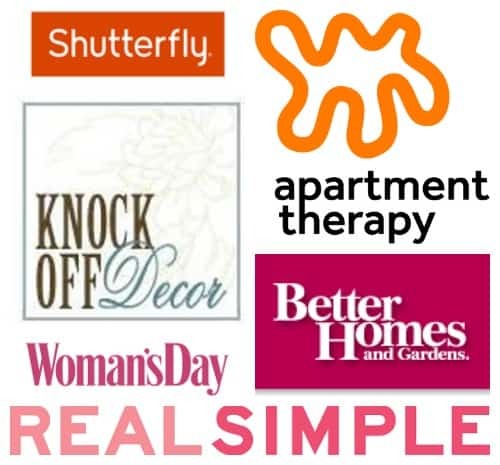 These bloggers work so hard creating pretty homes and original DIYs, please click through to the original source to pin their gorgeous images. And most of them are home tours so you can enjoy much more Fall inspiration! Thank you. I love using a feature piece like seasonal modern art for the holidays. Try something like this pheasant feather DIY art from Southern State of Mind, part of her Fall home tour. Love, Create, and Celebrate always has creative seasonal DIYs in her fresh and clean style. Head over to see more in Lindi’s Fall home tour. I can always rely on Angela from Blue i Style to interpret seasonal decor into something modern and metropolitan!! Love theses tic tac toe pumpkins from her modern Fall home tour. An easy go to modern tip with seasonal decor is to keep it monochromatic like this gorgeous room from Iris Nacole. I love the little pop of red for an element of surprise and it’s completely appropriate for Autumn. Stephanie from Casa Watkins Living does a beautiful job with global eclectic decor and it sure shows in her Fall home tour. Don’t miss out on all the colorful and fresh decorating ideas. Isn’t this simple and chic wall art for Fall from Julie Banner delightful? It’s just one of many beautiful seasonal decorating ideas in her Fall home tour. This gold glam Fall decor from Monica Wants It has such a fun and creative vibe! Check out her Fall tour for more inspiration. 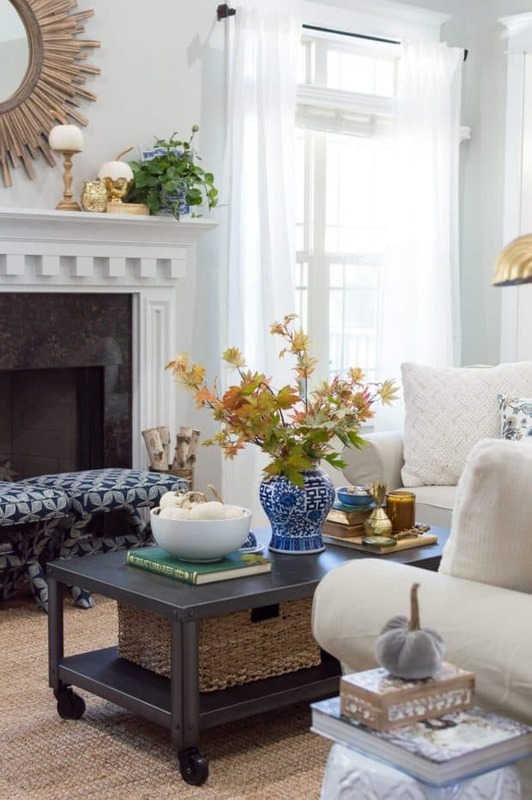 You’ll love these tips from Polished Habitat for transitioning into Fall. I love how her use of non traditional Fall colors stays true to her chic and glam style! Try Bliss at Home‘s preppy and chic layers for a cozy and modern Fall living room. Head over to see more! Add a blush pink to soften up traditional orange and red for Fall and you’ll get a gorgeous and fresh space like Inspired by Charm‘s Fall office space dressed up for company! Click the picture to see the rest of this gorgeous home. Whitney J Decor used a modern color palette with warm hues and gray. Love the statement art piece to bring it all together. Don’t miss her bold eclectic Fall tour to see all the goodies! The Home I Create has an excellent eye for classic style in a fresh and modern way. Check out her eclectic Fall home tour for more beautiful decorating ideas. Copy Cat Chic shared decorating ideas from discount stores that look anything but cheap in her Fall home tour. Keeping a neutral color palette and nature inspired decor keeps it modern and eclectic without be too fussy. Perfect. Cassie Bustamante has a perfect balance of textures and neutrals for Fall in her boho bedroom and soft blues and greens through the rest of the house that you don’t want to miss! This multi space room makeover By Brittney Goldwyn is for year round but it sure has the elements for a modern and fresh Fall space with it’s gorgeous moody color palette and taxidermy! Click over to enjoy the entire space. Here’s another creative blogger that I can always count on to be colorful, fun, and eclectic. Every picture in PMQ’s Fall home tour is eye candy friend! I had to include this stunning vintage eclectic room makeover from Domicile 37. It might not be Fall home tour but it’s berry hues, gray, and dramatic pops of black and gold sure make if Fall worthy for gorgeous inspiration! If you missed our early eclectic Fall home tour this week, just click the image below! Now I’m definitely ready for cooler weather! so many inspiring ideas! thank you for including me! Oh my pleasure Cassie! Your home is so warm, welcoming, and beautiful. Wonderful ideas! Love them all and so much inspo for the season. 🙂 Thanks for including me. Thank you and my pleasure!! Love your style. Great post! I was really looking forward to fall, especially because of the good weather and the beautiful decor. Love your decor ideas! All these ideas about home decor are really good and wonderfully presented by you. I really like the idea of mixing concepts, where art mixes with contemporary furniture, I really loved it.